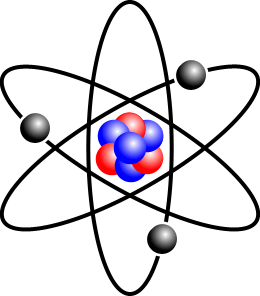 A chemical element is defined by the number of protons in the nuclei of its atoms – this is the atomic number. However, an element can have atoms with different numbers of neutrons in their nuclei, resulting in various “versions” of the element. An isotope is a variant of an element based on the number of neutrons in its atoms. The sum of the numbers of protons and neutrons of an atom is the atomic mass number, and the name of an isotope is defined by this number. Consider chlorine, which has 2 stable isotopes: chlorine-35 and chlorine-37. Chlorine has 17 protons, so chlorine-35 has 18 neutrons, and chlorine-37 has 20 neutrons. The natural abundances of these two isotopes are 75.77% and 24.23%, respectively. Thus, if you take a random sample of elemental chlorine that exists in the universe, you should find that about three-quarters of your sample consists of chlorine-35, while the remaining quarter consists of chlorine-37. 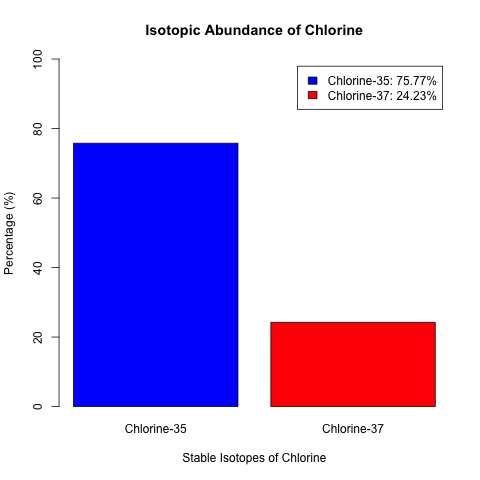 The isotopic abundances of chlorine can be displayed easily in a bar chart or a pie chart. In R, the relevant functions are barplot() and pie(). Source of isotopic abundances: “Chemistry” by Olmstead and Williams, 3rd Edition. Page 53. Here is my R code for generating these charts. # The plotting functions are "sandwiched" by "png()" and "dev.off"